From left, Jon Mize, Events and Corporate Partnerships manager with Be the Difference Foundation, is with organization past and current board members Darren Fishman, Julie Shrell, Lynn Lenschter, Lisa Hurst, Linda Bezner, Sheryl Yonack, Jill Bach and Gary Gardner, with perennial favorite rider and supporter, Roger Staubach. This year (not pictured), Atila Ali and Marissa Shrell have joined the board. The seventh annual Be The Difference Foundation’s (BTDF) Wheel to Survive indoor cycle event is returning to the Aaron Family JCC, Zale Auditorium Feb. 24. 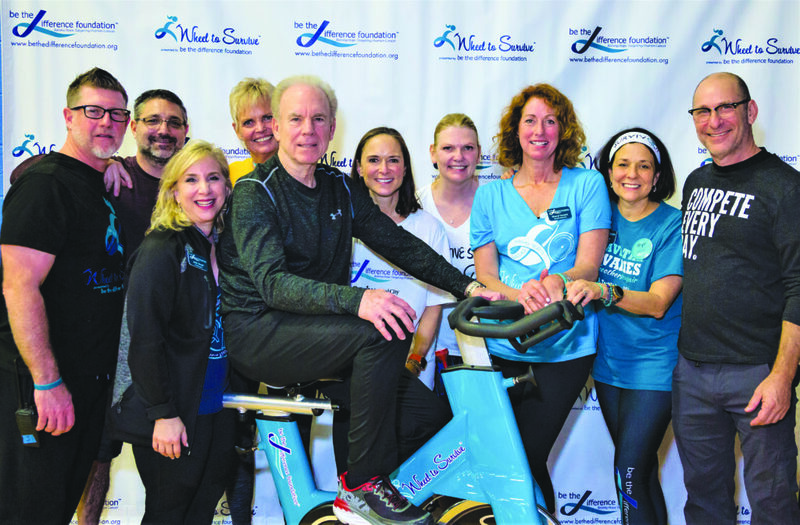 The ride helps raise funds for the foundation’s twofold mission: first, to increase the survival rate for women battling ovarian cancer; and second, to provide both hope for a cure, and a future in which ovarian cancer can be treated. More than $2.4 million has been donated to agencies helping those diagnosed with ovarian cancer since the ride launched in 2012. In 2018, approximately 22,240 new cases of ovarian cancer were diagnosed and 14,070 ovarian cancer deaths were expected in the United States. According to the Centers for Disease Control, about one of every 40 individuals of Ashkenazi Jewish ancestry has a mutation in the BRCA1 or BRCA2 gene, compared to one in 800 of the general population, increasing the risk of certain cancers, including breast and ovarian in women and breast and prostate in men. “This organization is where my heart, dedication, and appreciation are because my life, and many others, depends on it,” said Linda Bezner, who is co-chairing the event with Anne Baum. The two are leading a committee that includes BTFD’s Executive Director Shannon Albert and Events and Corporate Partnerships Manager Jon Mize, as well as Molly Aaron, Wendi Alston, Jill Bach, Jessica Buckman, Rose Kreditor, Lauren Lattman, Jeff Seutter, Lauren Shecht, Julie Shrell, Marissa Shrell, Simone Shrell and Sheryl Yonack. Bezner said that in 2003, she felt twinges in the area of her ovaries. A visit to her gastroenterologist led to a CT scan — and the call. Though the three-time cancer survivor had had a total hysterectomy and her ovaries removed years before the initial diagnosis, the scan showed an artery and her colon wrapped in an ovarian tumor. Surgeries, chemo and radiation followed, and then several years later the disease returned. These days, Bezner is six years into remission. Baum, with whom Bezner became friends when their children, now 31, were in kindergarten together, stood by her through illness, and now through chairing Wheel to Survive. The friends first rode in 2014. “We rode as a team, ‘A Positive Spin,’ with my sisters-in-law and I found my place,” Baum said. Dallas’ Jewish community, a tight-knit friendship of its own, stood by the organization, which has grown and expanded. In 2018, rides also took place in Austin, Boca Raton, Denver, Houston and the San Francisco Bay Area. The founders of Be The Difference Foundation are Jill Bach, Lynn Lentscher, Julie Shrell and the late Helen Gardner. Bach is an almost 12-year survivor, who inherited the BRCA1 mutation from her father, who never knew he was a carrier before the testing. Lentscher was the athletic “picture of health” but experienced painful and prolonged diarrhea, despite having had a hysterectomy. After palpating a mass and an elevated CA125 test, she agreed to have her ovaries removed, but woke up to a stage 3 diagnosis. She is now 21 years clear of ovarian cancer. Shrell, who was diagnosed at 48, BRCA1 tested positive, but not for breast cancer, which her paternal grandmother had survived twice in 30 years. She is now counting eight years of clean health. Gardner, of blessed memory, passed away in 2014 despite her heroic battle, yet lives on through Be The Difference Foundation, and the organizations and people it supports. Bach is BTDF’s board president. Other board members serving this year are Atila Ali, Linda Bezner, Gary Gardner, Lynn Lenschter, Julie Shrell, Marissa Shrell and Sheryl Yonack. Ovarian cancer accounts for 2.5 percent of all female cancer cases and 5 percent of cancer deaths because of the disease’s low survival rate, with four out of five ovarian cancer patients diagnosed with advanced disease that has spread throughout the abdominal cavity. Women diagnosed with localized-stage disease have more than a 90-percent five-year survival rate. Sisters Marissa and Simone Shrell, Julie’s daughters, created a “Why I Ride” wall to decorate Zale Auditorium, so that riders and visitors to the day are able to “meet” those who have survived, those who have not, and the riders who have been affected by the disease. Vendors include Chocaloca Designs, Designs by Sarina, Kendra Scott Home, Linen Casa, Scout & Cellar and Your Queen Bead. A raffle and a silent auction with jewelry, sports, restaurant, and vacation packages will run throughout the ride. Judy’s Mission Ovarian Cancer Foundation was the newest recipient to receive support from the 2018 Wheel to Survive in Houston. Judy’s Mission honors the memory of Judith Liebenthal Robinson by promoting awareness about ovarian cancer and its symptoms, calling attention to the need for early diagnosis and treatment, and funding research for the development of effective screening and treatment. Executive Director Heidi Suprun said the grant will support its local Survivors Teaching Students program, in which survivors speak to medical students, allowing the disease to surpass the statistics, bringing true faces to the field. Close to home, Bach, Bezner, Lentscher and Shrell are among the volunteers participating at Dallas’ UT Southwestern. Also receiving BTDF support in 2018 were the Mary Crowley Cancer Research Center, Lazarex Foundation, MD Anderson’s Ovarian Cancer Moon Shots Program and The Clearity Foundation. Wheel to Survive will take place 9 a.m.-3 p.m. Sunday, Feb. 24, at Aaron Family Jewish Community Center’s Zale Auditorium. A practice ride, free with Wheel to Survive registration, starts at 11 a.m. Sunday, Feb. 17, at Cyclebar at Lakeside Market in Plano. For more information, to donate, or to register for the 2019 Wheel to Survive, visit bethedifferencefoundation.org. Use promocode “TJP” for 25-percent discounted registration.